After approving the sendoff of hundreds of Toyota pickups into Syria for the exclusive use of its trained and funded “moderate rebels” to oust the Assad government back in 2013, the US chickenhawks are now ignoring the plea of the defeated terrorists, who are stranded in 17 buses, because Iraq refuses to accept them on its borders. The leaderless band of terrorists and their families have nowhere else to go since Abu Bkr Al Baghdadi supposedly died in one of the Russian air raids on the terrorist headquarter South of Raqqa City , more than 2 months ago. Such is the fate when working with two-faced Deep State stooges like John McCain, or Victoria Nuland. The sad part for the terror proxies is not just that they were abandoned for their unsuccessful operations in Syria, they were even bombed by US jets as they fled from the Lebanese border, as part of the ceasefire agreement reached through the Russian mediation and to which the US did not agree to in order the escape from post war responsibilities. The deal involved 17 buses and 11 ambulances, with 308 fighters and 330 family members traversing 350 km. of Syrian regime territory to get to ISIS-held areas along the Euphrates valley. In short, the US chickenhawks are now taking evasive maneuvers away from their culpability in the failed attempt to topple a legitimate Syrian government. The US-led coalition carried out an air strike today to block ISIS militants evacuated from Lebanon from reaching eastern Syria, the group’s spokesman confirmed. Hundreds of ISIS fighters and civilians were evacuated Monday from the border region between Lebanon and Syria under a controversial ceasefire agreement and were headed to a town near Syria’s eastern frontier with Iraq controlled by ISIS. ‘To prevent the convoy from moving further east, we cratered the road and destroyed a small bridge,’ said coalition spokesman Colonel Ryan Dillon, without providing further details on the exact location. It would not come as a surprise also if the US Deep State Department and mainstream media would claim credit to the defeat of these CIA terrorists, as the Russians, together with the now upgraded Syrian military, are finished with their mopping up operations against Daesh. At present, they are content with “proving the Assad government’s complicity with the terrorists” who sought its own ouster, by allowing the latter’s convoy to pass through its soil. So why isn’t the Syrian government listed as a party to the agreement? Because the Syrian government has been selling itself as “fighting ISIS and al-Qaida” to western media, pretending it is on the same side against terrorism. If Syrian President Bashar Assad was seen to be allowing ISIS members to transit his territory to go fight in Iraq against the US or against Iranian-backed Shi’ite militias, the regime’s narrative would be challenged. However, the reality is that 17 buses did drive through dozens of Syrian regime checkpoints, escorted by Hezbollah. Hezbollah in this story plays the “bad cop,” escorting ISIS, while the Lebanese government and Syrian regime are the “good cop,” turning a blind eye. In remarks reported by the NYT, Lt.-Gen. Stephen J. Townsend, US coalition commander, said the coalition had “struck every ISIS fighter and/ or vehicle that has tried to approach that convoy and will continue to do that.” The coalition wrote in a statement on Sunday that 85 ISIS fighters and 40 vehicles had been struck by September 3. It was the Lebanese Hezbollah leadership, of course, which asked for Assad’s permission to allow the busing of the terrorists through Syria and into the Iraqi border, so that the Deep State chickenhawks could reassign their bearded assets to Southeast Asia, or any other places of their choosing. 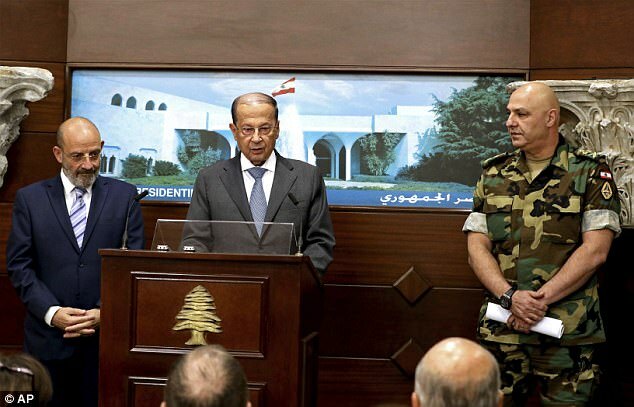 Admitting embarrassment, Syrian President Assad could not refuse the Lebanese people, along with the Russians and Iranians, who helped him preserve the integrity of the Syrian republic. Now is the time for all good people to stand together, and for the good people in the military and the various agencies to step up and support the good elected officials. Time to restore The Constitution to its proper Law of the Land status, and to punish those whom followed their own laws, and causing Crimes against Humanity for many decades. Time to shine full light on the Shadow Government everywhere. Oh…What a laughing stock this makes out US/Israely/Saudi governments!…For them to try and “Rescue” those mercenaries is admitting that THEY belong to THEM and were created by THEM in the first place. This reminds me of the saying: Oh what a deadly web they weave when they practice to decieve! A fuzzy report on a fuzzy situation. Or maybe I’m just slow. How can the US military even take themselves seriously, when they must be dumb, not to be aware that they’ve become the full out laughing stock of millions throughout the world!– So at the behest of Hezbollah, President Assad agreed to show the terros mercy and Hezbollah escorted them off the “premises” so to speak! So, from what I understand. the yellow liver ones across the Pond now want to claim the honour for driving the last terrorists out of Syria !? ?— If that’s correct, the cheek of it leaves one breathless– even while its come to be expected from the US as the norm! No sweat– virtually the whole world knows what an immense feat Russia, Syria, Iran, Hezbollah, the Iraqis and a number of other braves fighting alongside them– had achieved in Syria!! This, while being short-circuited and stabbed in the back by the US/-Saudi/Israel and western coalition and their paid terrorist ‘mercenaries’ — at every turn! — from the battlefield, to the infiltration of CIA sponsored White Helmets, down to western fake news media — another horrific story, amongst so many others exposing the US’ shame to the world. How tragically sad for ordinary Americans– humiliated before the world by the unspeakable betrayal of their own government. As for the J.post– what sour grapes lies! Bitter and twisted that they did not get their way in Syria! One can only take it from whom it comes– but make no mistake there is far more to it than a sound and humiliating defeat — there is hatred for Syria, for Russia, Iran and Hezbollah. For this reason, many of us continue feeling a grave concern– even bordering dread, that Syria may suddenly be attacked and invaded out of the blue — under cover of darkness, in the small morning hours, by the US and its cohorts, because the ungodly dreams this cabal had for lording it over Syria– and then from Syria, attacking, invading and conquering Iran, lie shattered at their feet. Hope Russia, Syria and Iran and also Hezbollah– remain on the highest alert. And of course, Victoria Nuland is JEWISH. Just a coincidence that all the chickenhawks and conspirators and elitist pillagers are all Jewish right? Yet Russia is the only one with testicles to stand up to israel and to remove its jews and sabbos goys and freemasons? Ane even then, Putin does it SECRETLY cos Modi of india sold out to israel, brazil sold out to israel, china usa uk canada and europe are all infiltrated by jews?? And who knows how China will play out now that israel is targeting China for war to try stop its one belt and road global infrastructure project. Ahmen, hit the nail square on its head. Couldn’t have said it better myself. Who rescued all those men, women and children ISIS/ISIL terrorists genocided, raped, cut off heads, drowned in cages, burned alive in cages, and destroyed antiquities? Don’t rescue the. Arrest, charge, prosecute, jail and execute them. Freeze all their assets for war reparations. And to all those nations that helped fund, support and promote the evils of ISIS/ISIL, you’re next.